Mr. Rivera was admitted to Cortlandt Healthcare in May just days after his eighty-first birthday. He was seeking a rehabilitation team that would help him return to his everyday tasks and ability to live a normal life. Mr. Rivera was discharged from Hudson Valley Hospital Center after undergoing an amputation above his knee due to an infection he had in his foot. After a very successful surgery, there was recovery time at the hospital and then Cortlandt eagerly awaited his arrival. That Thursday morning in May, Mr. Rivera and his wife (who is always by his side to support him and be his set of eyes), were introduced to the nursing staff, therapy staff, and the concierge department. He would also be introduced to the activity’s coordinator, and a kitchen staff member to discuss meals for both him and his wife. Although overwhelmed with all the new faces and changes, Mr. Rivera was ready and eager to start his journey! On top of Mr. Rivera being a recent above the knee amputee, he is also legally blind. This meant that important goals had to be made between Mr. Rivera and Cortlandt’s well-trained rehabilitation team. The goals would include walking over a certain distance, being able to negotiate steps, and perform daily activities such as getting dressed, using the restroom, hygiene, and car transfers to name a few. 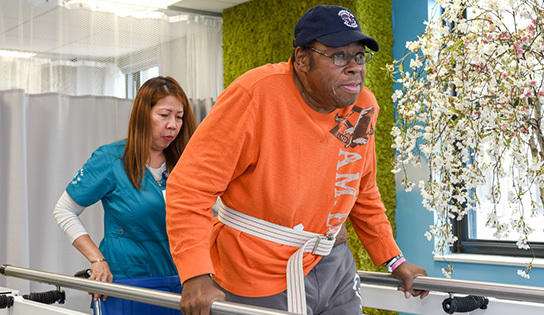 During the first few weeks, Mr. Rivera began therapy where he focused on gaining muscle, and learning how to walk with this new amputation. It was a new experience for Mr. Rivera, but with the whole team encouraging him, and family support, he was able to make tremendous progress. In June, when Mr. Rivera’s prosthesis came in, his own motivation was kicked into high gear. Mr. Rivera and his family were then introduced to Dennis and Todd, the leaders of the Comprehensive Amputee Rehabilitation Program. The Comprehensive Amputee Rehabilitation Program is an in-house program which builds off of everything that the patient learns going through their rehabilitation journey in our community. Dennis and Todd take our patients to the next level of their life skill goals. They are motivators, encouragers, supporters, and they are able to create a bond and structure between them and the patients that in return creates a true amputee support group, where they can turn to when they are in need assistance or someone to talk to that understands what they are going through. Within three weeks, Mr. Rivera was able to successfully complete tasks such as getting in and out of bed, bathing while using a shower chair, and being able to use the restroom independently. Over the next two months, Mr. Rivera would now focus on gaining muscle, balance, and being able to maneuver his new prosthesis, with the help and support of his wife. At first, Mr. Rivera was able to safely ambulate a total distance of 40 feet with his prosthesis and rolling walking but then, a week later he was able to ambulate a total of 100 feet, and finally, he graduated with being able to safely ambulate 200 feet! The next was for Mr. Rivera to accomplish the steps. In order to have a safe discharge home, Mr. Rivera needed to demonstrate he could negotiate four steps and with his dedication and the support he had, Mr. Rivera was able to negotiate eight stairs with his prosthesis! With many accomplishments and many goals that were made and succeeded, Mr. Rivera was able to have a safe discharge. With support from his wife and family, Mr. Rivera will be able to continue his journey that he began at Cortlandt Healthcare. Along with Dennis and Todd, and the whole Cortlandt team, we could not be more proud of you, Mr. Rivera. Always remember to keep moving forward! We wish you the best of luck!